Back in our hometown for another celebration of our 100th issue. 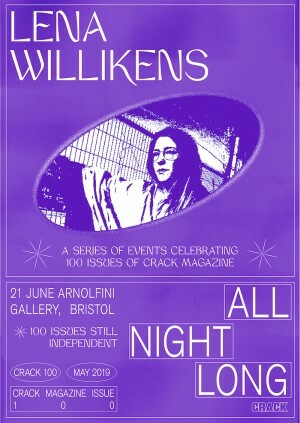 Amsterdam DJ and longtime Crack favourite Lena Willikens will play all night long at Bristol’s Arnolfini, soundtracking a night at the city’s premier alternative art-space with intriguing deep cuts and dancefloor oddities you won’t hear anywhere else. Since a formative residency at Salon Des Amateurs in Düsseldorf, Lena has gone on to become one of the most respected and sought-after DJs on the map with a deeply artistic and explorative approach to playing. In her sets, she delivers wild journeys through genre and pace that refuse to be pinned down.